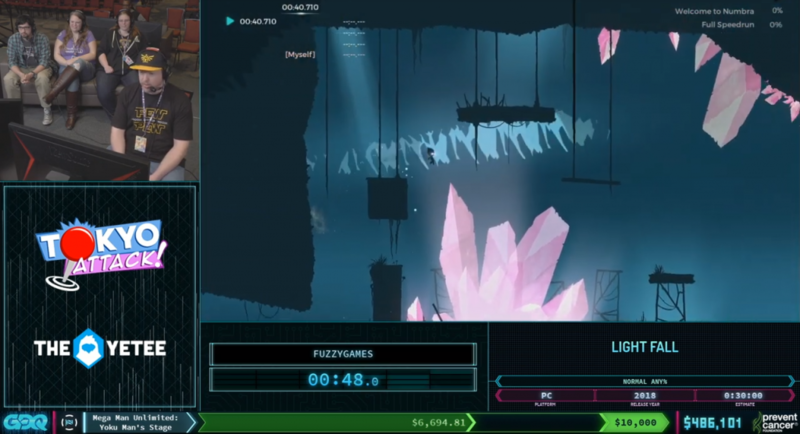 In January, Light Fall was featured at AGDQ (Games Done Quick) in front of more than a hundred thousand viewers on Twitch. We decided to contact FuzzyGames, the speedrunner who submitted Light Fall, so he could share his thoughts following this experience. You can also watch his whole run on Youtube. AGDQ (or simply GDQ) is considered by most to be the biggest speedrun event in the world. The goal is to complete the games in the fastest time possible and raise money for charity. 1. First things first, could you explain how this all came to be? What was the process of submitting Light Fall to GDQ like? 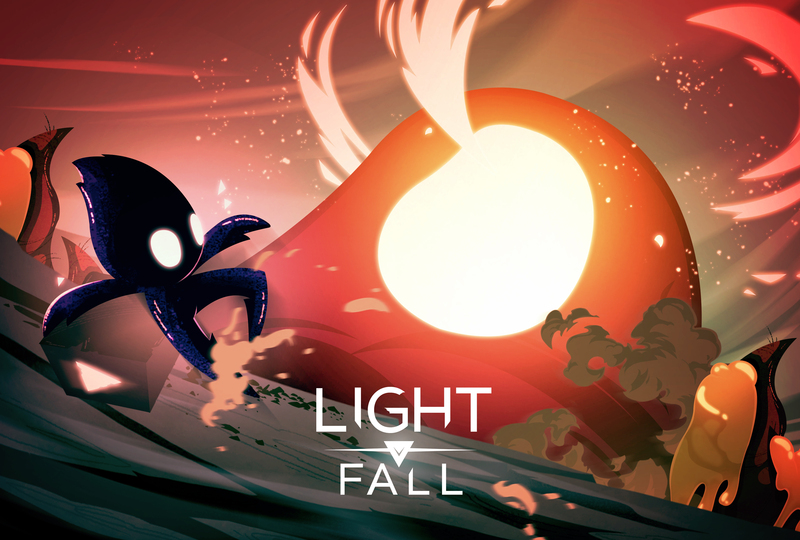 How did you end up playing Light Fall at the event? At first, I randomly found Light Fall online. I have always been a huge fan of platformers and noticed Light Fall was releasing at the time I was looking for new games to play. It all worked out well from there, I built a little bit of history with the game and even pushed for the world record at one point, which I did get. Fast forward a little bit and GDQ is coming up… and I really wanted to submit. This event is such a big deal for speedrunners. In my mind, I had to submit Light Fall. I had played so much of it and submitted in many different categories. I thought nothing would ever come out of it but I got accepted and that was an amazing feeling! 2. Following up on that, how many categories can a speedrunner submit for a game? Could you, for example, submit a 100% run and an Any% run? How does that work? It was one submission of Light Fall, but I could indeed submit for multiple categories. In my case, I submitted Normal Difficulty Any% and Hard Difficulty Any% and only one of them was accepted. 3. What was your initial reaction like when you got the news? It was funny because GDQ announced in advance at what time the news would come. So, I’m just sitting here on nails, waiting for news of the submission. I was so nervous, even though I believed there was no chance I could be selected… I kept refreshing the submission page and at one point I saw that one of my submissions got accepted. My whole body froze… I didn’t know if this was real or not. I thought somebody must have clicked on the wrong button or something! 4. I can imagine that… GDQ must be the equivalent of the Super Bowl for speedrunners. It must feel like the biggest stage to display your skills on? Indeed, I don’t know another venue where you would have more than a hundred thousand people watching you speedrun a game live… It’s surreal and scary and amazing at the same time. 5. Have you seen a growth on your stream and channel since the event? Have you got any new followers since? I did get a surge of new followers after the performance. A lot of people decided to follow just out of the blue. I’ve had people coming on my stream since and say “Hey, I saw you at AGDQ and decided to come check you out. Good job on the run!”. It feels good to have people say that they enjoyed what I did and want to support it more. 6. Talking about the run itself… How did you feel when you sat down on the chair prior to starting the run? 7. Are you satisfied with your performance at GDQ overall? Before leaving for GDQ, I sat there and said: “Okay, I know this is a big deal and a lot of pressure comes with it. I need to set realistic expectations for myself and still have something to aim for”. I thought about it and like every other speedrunners, I have my own personal best record. That wasn’t my goal obviously, I aimed for a more reasonable time. On such a big stage, many things can go wrong. I set out for a time around 25 minutes and that’s what I got to (27:13). For that reason, I’m pleased with the run. There are some things I could have done better, for example the Mictlan fight which I messed up a bit. Overall, though, it was good and I’m just glad it didn’t go horribly wrong! 8. If we go back to your passion of speedrunning, what originally got you into such discipline? It’s funny that you ask that, because thinking back to how I started speedrunning… it starts with GDQ itself. I remember seeing the event’s videos from 2013 and I saw a well known speedrunner, CalebHart, run a Mega Man game. Being a huge fan of this series, I thought to myself: “That’s really cool… I feel like I’m not going to be great at it, but I would love to do something like that.” And that’s what got me into speedrunning. I started replaying a lot of the games that I enjoyed as a kid. From there, I kept learning and improving, thinking about what games I like to speedrun and it just evolved from there. 9. Really cool… That brings me to my next question: Aside from Light Fall, what other games do you enjoy speedrunning? Most people know me probably for two games that I really enjoy speedrunning. The first one is The Legend of Zelda: A Link to the Past. It’s a fantastic game and it is my favorite of all time. The second one would be Celeste, which is a more recent one. It’s a platformer that feels really rewarding to play through. 10. Speedrun has many categories; 100%, Any%, Glitch-less… Do you have a favorite category to speedrun? Just to call back out to Zelda: A Link to the Past, some people know that I am a big fan of the glitches in that game. I tend to lean to more glitched categories when it is an option, but I am also a little bit of a purist when it comes to glitches too. If you’re going to follow a glitch category, I kind of want it to stick a little close to the formula the game originally intended. I feel like glitches should accentuate what the game was originally going to deliver and not necessarily skip huge parts of it and take away from the experience. Other than that, I would say Any% is my favorite. 100% tends to be a little drawn out in some games. Any% is the typical “let’s see how fast I can beat it”. 11. A lot of people really enjoy watching speedrunners, but are sometimes put off by the difficulty of such discipline. What would you say to someone in that situation? The first thing is to not expect to learn it all quickly because nobody ever does… Secondly, I feel like the only difference between someone who currently does speedrun and someone who doesn’t yet is that the speedrunner is willing to fail. A speedrunner is willing to be bad at the game until he masters it. Start by picking a game that you enjoy, a game that you could play over and over again… because you’re going to see it a lot. If you find some tricks too hard, just skip them and come back later. Your time will not be competitive out of the gate, so just give it a shot and see where it goes. 12. Now let’s put you in my shoes… If you were a developer of Light Fall and could make any changes to the Speedrun Mode, what would it be and why? I feel that in its current state, the game mode is very enjoyable and welcoming. When the game first came out, there were a couple of rough edges that did get worked out quickly. That was an example of great communication between the community and the developers. Honestly, I don’t feel like speedrunners are too picky in general. A lot of games get speedrun without a dedicated game mode, so it’s a bonus. I feel like the team did really well with it! 13. Lastly, could you describe yourself as a streamer and speedrunner? And if some of our fans would like to know more about you, where can they do so? Well, you already know my name (FuzzyGames). I’ve been streaming on Twitch for a little over a year and it’s the best place to find me. You can also follow me on Twitter. I’m always online Tuesday and Wednesday nights and Saturday and Sunday mornings. I try to keep running a few different games to make it exciting. Feel free to drop by! This concludes our interview. We hope you had a great time learning more about speedrunning. Bishop Games always makes sure to support the speedrunning community. As for our projects, we know we have been quiet online recently. We are currently working on a brand new, top secret project and we are also preparing something for Light Fall! Stay tuned!